Smart cities and smart city projects have been among the most actively discussed realizations which are made possible by a purposeful and integrated IoT (Internet of Things), data and connectivity approach, leveraging a mix of solutions and other technologies. These range from analytics and smart city platforms (systems) to LED technology and wireless IoT protocols in a context of smart street lighting or energy efficient building technologies to reduce pollution and energy usage in an intelligent building energy management context, to cite a few examples. Although there is an important technology aspect, smart cities are about far more as we’ll see further. One can even debate about the meaning of smart, certainly within the incredibly complex and holistic reality of smart cities where in the end it’s about meeting the needs of citizens and solving challenges of people, society and urban communities. Yet, more about that further in this article. Let’s face it: with anything that is called smart nowadays, whether it concerns smart buildings, smart energy grids or smart cities at the very core is connectivity and data, as enabled by various technologies and as turned into the intelligence that serves as a basis for decisions. This doesn’t mean that connectivity is just about IoT of course. Connected communities and engaged citizens are at least as important. Nevertheless, we’ll start with the IoT and the technological backdrop against which smart cities are approached to end with what truly matters; the goals and outcomes that shape the evolutions of and in smart cities on all levels. Until at least 2020, smart city projects are poised to sharply increase as we move from ad hoc smart city projects to the first true smart cities. This growth has in fact already started since a few years, with an acceleration in 2016. A universally valid definition of smart cities – do we need one? The announcements on new smart city initiatives and investments are also accelerating and if we look at the major IoT projects, smart city projects are among the leading IoT segments in practice. Lessons of early initiatives get shared and positive returns are reported, further driving the smart city space which is also driven by government investments. We mentioned a few smart city projects previously: one in the smart environment context (air quality monitoring to fight pollution in the city of Glasgow) and one in a smart flood alert context (an open source flood sensor network in the UK). These are maybe not the smart city use cases that immediately come to mind but they are crucial and if you know, for instance, the challenge of pollution in urban environments, it’s easy to see one of the key reasons why smart city projects are set up: because they can offer immediate and useful benefits to citizens. Citizen-centricity indeed. More popular smart cities use cases include smart parking, smart traffic management, smart street lighting and smart waste management. Still, also these cases often combine a mix of enhanced efficiency, urban problem solving, cost reduction, better living in urban regions and putting citizens first for a variety of reasons. We previously wrote about research by Accenture that looks at the usage of newer technologies, including the Internet of Things, from a perspective of citizen-facing public services, which found that improving citizen satisfaction indeed by far ranks first. As the infographic of the research indicates, improving satisfaction of employees also ranks high (80 percent) and the implementation of newer, connected, technologies already leads to tangible outcomes in a slight majority of cases. In order to be a ‘true’ smart city, cities need to have an integrated approach whereby various projects are connected and most of all the data and platforms are glued together in order to achieve all the benefits smart cities make possible. Open technologies and open data platforms will be key to move to that next stage. According to IDC, the open data platform will emerge as the next frontier in Internet of Things platform discussions by 2018. Although this will come with hurdles and IDC doesn’t specifically mention smart cities, it’s clear that this open data platform evolution will certainly be prominent in the smart city space. In its “IDC FutureScape: Worldwide IoT Predictions 2017“, where IDC mentions this open data evolution, the company also states that by 2019, a whopping 40 percent of local and regional governments will use IoT to turn infrastructure such as street lights, roads and traffic signals into assets instead of liabilities. As mentioned, smart city projects already are all around us, with a constant stream of announcements regarding new ones. 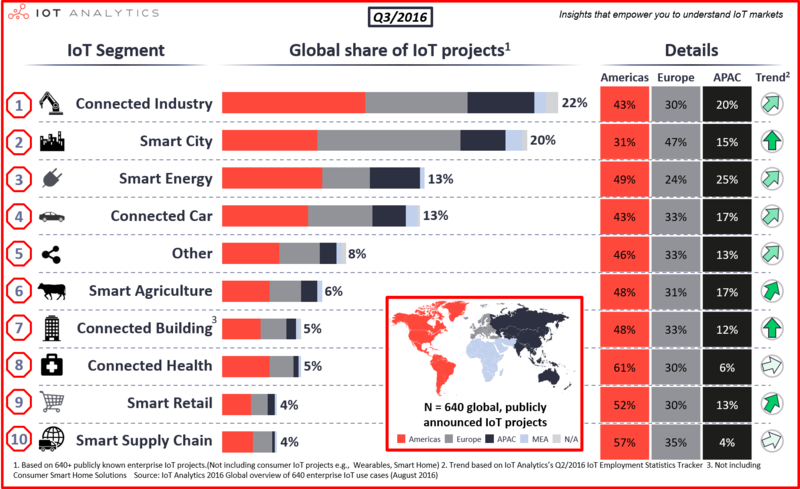 When Germany-based IoT Analytics, an analyst firm looking at the Internet of Things, announced a new report which essentially is a list of 640 actual, real-life Internet of Things projects as they already exist today, the company said that of all the IoT segments it looked at, smart city projects ended second, after connected industry, and before smart energy and connected car. This is especially the case in Europe as the graphic from the company below indicates. Within the segment of listed IoT projects, IoT Analytics fond that the most popular smart city applications are smart traffic, followed by smart utilities. Also city safety is a big one. Although smart city projects mature and new ones are being promoted and/or deployed, it will take several more years before we really can call a city a smart city. Smart cities today are more a vision than a strategic end-to-end approach. You can image that in order to have a true smart city there is a lot of work across the various activities, assets and infrastructure, which can be turned into smart versions. Realizing a true smart city can be incredibly complex as so many factors and parties are involved and cities have numerous tasks and functions. Moreover, in a smart city all these areas are connected as mentioned and that doesn’t happen overnight. There is a lot of legacy, there are several operations and regulations, new skillsets are required and many connections need to be made and there is loads of alignment to do on various levels (city administration, public services, transportation services, safety and security, public infrastructure, local government agencies and contractors, education services, the list goes on). Obviously, the complexity of full smart cities doesn’t need to stop the smart city evolutions and projects. Complexity is also contextual and as cities exchange experiences and develop smart city projects with clear benefits they have the opportunity to grow their expertise and learn from potential failures. Having a roadmap in mind, with various stakeholders involved, of course greatly expands the possibilities of current ad hoc smart city projects in a further, more integrated future. Another challenge that can hardly be overlooked concerns the attitudes and willingness to change things for the better among citizens as we tackle below. Also the financing of smart city initiatives is one of many other stumbling blocks. In that sense it’s good to see government initiatives, sometimes national, sometimes supranational, sometimes on smart cities in general, sometimes on a specific aspect such as ecology and occasionally by industry players as in the City Infrastructure Financing Acceleration Program from Cisco. This means that choices need to be made that can easily be scaled or integrated or, if needed, be easily replaced with better (IoT )technologies. In the end, the IoT technology stack for smart city applications today is relatively easy and cheap for many use cases such as smart waste management or smart parking. Urban environments typically have good wireless coverage for cases with moving parts, you have the cloud, there are several point solutions and products which are designed for smart city projects and in several cities across the globe there is low-power wide-area network connectivity available (LPWAN) which suffices for many applications. In fact, when drafting its list of IoT applications, IoT Analytics found that 59 percent (!) of all LPWAN projects today are part of smart city initiatives while LPWAN in general is only present in 10 percent of the IoT projects the company identified. Choices regarding connectivity, data exchange, IoT platforms and so forth will evolve as we start moving to real smart cities. It’s best if these future choices are already being taken into account for current smart city deployments. There certainly isn’t a shortage of smart city use cases and projects. As per usual in the application of new technologies for anything ‘smart’ there isn’t really a definition of smart cities, let alone of smart city applications. While most professionals look at smart cities from the broader perspective, both from a goals and technology perspective, others will call any mobile app, developed by one or the other department, a smart city application. The Internet of Things is virtually always present, although there are exceptions. From a technological and strategic perspective we obviously also need to look at security (which is also a goal in the context of safety, for instance), Big Data, mobility (in the broad sense of mobile ability, mobile technology and being mobile, whether it concerns public transport or applications for the less mobile citizen), cloud and the full stack of connected technologies and information-related topics. It’s clear that information, and thus also information management and data capabilities are essential for the smart city of the present and future. While smart cities are inevitably linked with technology, a smart city vision is about more than that. Part of the essence of smart cities is leveraging the appropriate technologies to improve quality of life in cities in general. As earth’s population grows, new cities need to be built and existing urban areas keep developing. Technology, when properly used, is essential to tackle these challenges and help solve numerous challenges which cities today face. Yet, in order to really create a smart city world a far broader vision is needed. Take a look at the first video in our post on Smart City Expo World Congress 2016, which took place in Barcelona, Spain, one of those leading cities in smart city developments, from November 15th until November 17th. The topic of the opening remarks in the video: “Cities for Citizens, Citizens Changing Cities”, at the same time the theme of the event. In the beginning of the video the audience gets to see another video that sets the tone of the opening remarks and event. It paints a rosy picture of a smart city world with connected and empowered citizens. You get to see people and hear a series of words that stick. Evolving. Visions. Tomorrow. Together. Common. Move. Grow. Learn. Possible. Love. Care. Like. Breathing. Experiment. Change. Create. Innovate. Improve. Alive. Dreams come true. And the sentence “we can do so many things”. In 1:30 minutes attendees get to experience ‘carewords’ and emotional impressions before the actual congress starts. After some silence the participants in the opening address enter the stage. Jerry Hultin, chairman of Global Futures Group, chairman of the advisory board of the Smart City Expo World Congress and seasoned smart cities expert welcomes the audience and opens the Smart City Expo World Congress 2016. He says: “making the cities of the world places where the people want to live, where citizens want to participate and where technology gives everyone a better life”. a better life – through technology. Yet, the questions are numerous and the stakes are high. After opening remarks from Gerardo Pisarello (Vice Major Barcelona), Gila Gamliel (Ministry for Social Equality of Israel), Rajesh Agrawal (Deputy Mayor of London for Business) and Jiangbo Ni (Vice Minister of the Housing and Urban-Rural Development ministry), Jerry Hultin points out some of them. Did we grasp the opportunity of social technologies to connect for a greater good? He reminds that, while today 54 percent of humanity lives in cities and 80 percent of wealth is created in cities, in the next 30 years approximately 2.5 billion more people will live in cities, bringing the total of people who live in cities to 70 percent of humanity. Now that the technological possibilities and challenges are becoming clearer the questions and concerns are on the rise too. Technology and jobs. Privacy. Refugees who leave where they live because where they live is inadequate. Dissatisfaction among citizens as we see across the globe. Financing, return on investment, new revenue sources, the list goes on. Yet the main question of all: will technology really make lives of people in cities better? How can technology be used to achieve just that? Jerry Hultin clearly mentions the challenges at hand in his opening address at the Smart City Expo World Congress 2016. And here is an additional question: what else is needed since technology alone is never the answer? No matter how smart our smart technologies are and how smart they can be used there are essential elements which we need to tackle as well – and they are predominantly human. Technology can help in improving safety but what about trust? In the wake of attacks across several cities around the globe, political upheaval, natural disasters, political scandals or even simply the uncertainties that come with radidly changing times, distrust is high and hope for improvement is low. Citizens set up initiatives but in many cities they don’t feel included nor asked for participation, which is even more so in specific population groups and in countries where the focus on smart city technology to improve the citizen experience is high but the attention for basic human rights and participation is low. Citizens also need to have the will to change. When the city of Madrid wanted to implement measures to fight pollution the initiative was immediately turned into a political question and protests emerged. What is the use of monitoring air quality to prevent pollution if the will to change behavior as a consequence is not there (regardless of the exact context of the decision in Madrid)? Seeing challenges and having solutions to tackle them is one thing, acting is another. This isn’t even about change. It’s about engagement. Smart cities aim to better engage citizens but how are citizens engaging themselves? As an example: we donated to the building of a Cruyff Court in Brussels. Here you have an initiative with volunteers and citizens wanting to create more social cohesion by offering youngsters opportunities through sports in The Netherlands and Belgium. And the next step was the city of Brussels or, more precisely, Molenbeek. Internationally, Molenbeek is most mentioned in the context of terrorism but it is part of a city, our youth memories and in need of people who act and try to connect. And that brings us to the last part: social cohesion. Where has it gone and how do you bring it back, especially in the mega-cities of the future? Social cohesion combines all of the above and it’s the fabric of a city where people want to live, love, grow, learn and care. It’s the fabric of a smart city world. “We can do so many things”, Jerry Hultin stated. Indeed but, in the end, we need to start with ourselves. In 2014 we had an interview on the BT Let’s Talk blog with Fred van Beuningen, back then Managing Director of Rotterdam Partners, on sustainability and smart cities. Van Beuningen had been involved in the EU’s Smart Cities project before and here is what he said when asked whether a smart city is a sustainability. Striking the balance between all that and with social cohesion in mind is the often forgotten essence of a smart city and community. Or better: it’s what a community is about to start with, just as social technologies once stood for the opportunity to connect instead of rant, attack, brag, ‘influence’, alienate, fight and troll. Did we grasp that opportunity of ‘social’ despite all the technologies for a greater good? Support any other initiative in your neighborhood and set a step in the direction of a smart city in the human sense, as small as it may seem. Because the future of smart cities is what you and we will make of it, as is the future for the adults of tomorrow and the many years after that. The concept, vision, definition and reality of smart cities is in flux. There are few terms that have been so vaguely and differently defined as smart cities, even when we go back to the days before everyone called them so and many spoke about intelligent cities, smart communities, digital cities or even ubiquitous cities. In more than one sense it’s a good thing that the definition of smart cities is not set in stone. A city, let alone an urban area, is an organism and an ecosystem that leads a life of itself and is composed of many living connected components in constant motion: people, in their capacities as citizens, workers, tourists, students and so forth. A universally valid definition of ‘the smart city’, let alone ‘the ultimate definition of smart city project use cases’, would overlook the by definition highly dynamic, changing and different nature of a city. Reducing the smart city to the technologies that enable outcomes by leveraging connected devices, systems, information networks and, in the end, insights from connected and actionable data-based intelligence for a fixed pre-defined set of reasons that ultimately are about people is a way of defining it. However, is it relevant? It ignores the various priorities in several cities and countries, it overlooks the cultural aspect and it puts technologies within various goals front and center. And even if we would limit ourselves to the technological dimension, which is of course an essential part, we would easily overlook the fact that also technologies are in constant and increasingly accelerating motion with new possibilities emerging, just as on an overall city and community level new challenges emerge. And it’s not just the technologies that are emerging which are in motion, it’s also the perceptions and people with regards to these technologies, again just as on overall city, community and country level perceptions and attitudes can change. By way of an example of the latter: who would have believed in, let’s say 2015, that in 2018 we would live in an entirely different world where more nations and communities focus on their priorities and the very concept of globalization would be under fire? It is important to realize the individuality of each city and country. It is important to take into account the individual citizen. And it is important to look at the dynamics within communities, cities and groups of citizens as well as their interactions with smaller and bigger ecosystems and with the connected technologies in the smart city. One can hardly compare a smart city such as Dubai where technology and luxury are part of the goals as such within the scope of the city’s and leaders’ ambitions and smart cities in regions with far less means, major socio-economic challenges or major pollution challenges. Or smart cities in countries with a population that has aged much faster than that in other countries, Japan being the obvious example. Or smart cities in the fastest rising economies. We can go on. It is also hard to compare the political and socio-economical DNA of various smart cities. In some the call for citizen participation and participative democracy is far higher than in others while in some the very concept of a participative democracy is even unthinkable. Ask ten different people from ten different countries what a smart city is for them and you’ll get ten different answers. You would probably get more similar answers if you ask them what they expect and hope to ‘get’ from the cities they live in. Moreover, cities and societies, as well as visions on cities are not just differing across regions, places and even demographic groups within one city, they also evolve over time. So, even if we stick to the very basic definitions of smart cities within their technological roots there is no reason why this couldn’t change and effectively does change as do visions on the role and place of technologies evolve and differ as well. Obviously, cities, citizens and smart cities also have a lot in common. They do share some DNA. Universal values and human needs do exist, even if they can be filled in differently and in some cases (temporarily) put aside. Yet, don’t be surprised if you visit a smart city where the focus is far more on ecology, privacy, citizen participation or even the transformation of governance as such instead of a more technological focus you might be used too. It’s in diversity and dialog that progress gets the space to take shape. And it’s in both the shared and the differing traits and DNA of what makes a smart city smart that the dialog about smart cities helps us see what a smart city could and, depending on that individual context, should be. Smart city technologies are part of that shared DNA, as are many challenges and priorities. Just don’t limit the scope of smart cities to universally valid smart city use cases, priorities, visions and definitions. For some technologies are enablers of better ways to run cities, serve citizens and prepare for current and future challenges. For others the ways citizens are involved and how cities are ran have become at least as important, also on the technological level. For an example of a smart city where citizen participation and even a form of participative democracy takes center stage in the revisiting of the smart city vision and strategy it suffices to look at Barcelona as explained in this article on the edition 2017 of Smart City Expo World Congress. At the end of 2016, Machina Research (now part of Gartner) compiled a report based on an analysis of the strategies across 22 smart cities. As a result, a ‘Smart City Playbook’ was developed with, among others, 6 smart city best practice areas. As mentioned earlier, at the Smart City Expo World Congress 2016 in Barcelona, Jerry Hultin, chairman of the advisory board of the Smart City Expo World Congress, shared the challenges facing smart cities beyond technology. On our overview page of the event we offer some key takeaways with additional resources on topics such as urban development. As is the case everywhere, air pollution is a major challenge in smart cities. Smart cities have an opportunity to play a role in fighting pollution and the broader sustainability picture. In one of the videos we listed in our Smart City Expo World 2016 overview, the key theme is even how smart cities can fight pollution and climate change in times where sustainability is under pressure. In an IoT-enabled smart city application case we look at how the challenges can be tackled in practice. One of the tasks of local governments and cities, certainly in public services is to enhance citizen satisfaction. This is also the case in smart cities. Research from Accenture tackles the technologies in public services and the key role of citizen satisfaction. A full list of all possible ‘smart’ applications that are designed for smart cities or can be leveraged in a smart city context is sheer impossible as each city is different, there are loads of services and several public functions are organized differently across the globe (e.g. local transportation networks, organization of tourist services, etc.). Public services such as citizen services, tourist services, public transportation, identity and administration, and information services. Public safety where we can find applications in areas such as smart lighting, environmental monitoring (remember the flood network), asset tracking, policing, video surveillance and emergency response. Sustainability, including environmental monitoring, smart waste management and recycling, smart energy, smart metering, smart water, etc. Infrastructure with, among others smart infrastructure, structural health monitoring of buildings and monuments, smart buildings, smart irrigation (for instance in parks) etc. Transportation: smart roads, connected vehicle sharing, smart parking , smart traffic management, noise and pollution monitoring, the list goes on. More integrated solutions for smart city functions and services in areas such as smart care, smart education, smart governance, smart planning and smart/open data, which is also a critical smart city enabler. Top image: Shutterstock – Copyright: jamesteohart – Smart city background image: Shutterstock – Copyright: Dmi T – All other images are the property of their respective mentioned owners.